Driven by the hard work of millions of students, parents, educators and community leaders and aided by public and private initiatives across the country, the high school graduation rate reached a record 84.1 percent, according to the 2018 Building a Grad Nation report from Civic Enterprises and the Everyone Graduates Center at the School of Education at Johns Hopkins University. The annual update cites public media’s long-term commitment to improving youth outcomes through education and career readiness. The report tracks progress toward a national goal of a 90 percent graduation rate by 2020. While the national on-time graduation rate continues to increase, and some states and districts are showing remarkable progress, key student subgroups are lagging significantly behind. The 2018 report examines three key areas: high school data trends across the country, the state of high school graduation rates for the largest historically underserved student subgroups and the lowest performing high schools and the connection between high school and postsecondary pathways. 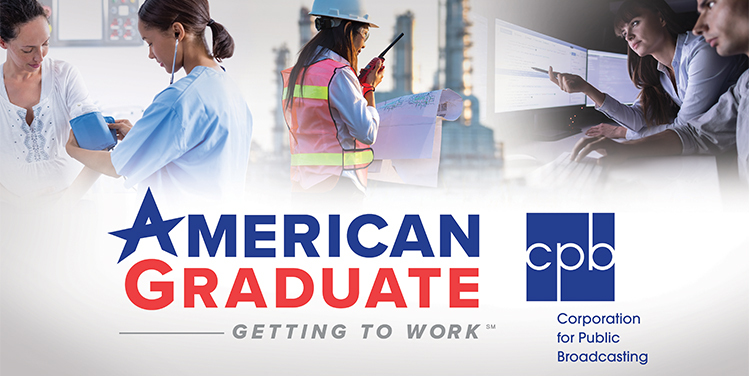 Earlier this year, CPB launched the latest phase of public media’s American Graduate initiative to strengthen the school to work pipeline. Stations across the country are partnering with businesses, high schools, post-secondary programs, government entities and workforce development organizations to advance education and career readiness and to examine workforce challenges and opportunities in local communities. Examples of public media stations connecting education and jobs include KUEN’s partnership with an online portal called “UtahFutures” and PBS Charlotte’s video series featuring local industries that need more skilled workers. Through American Graduate, stations have also inspired citizens to get involved and become American Graduate Champions, the caring adults who very often make the difference in a young person’s life.